I began family history research just before FamilySearch and Ancestry became readily available online. That means I started census research using microfilmed copies of Soundex index cards to find my families in the census. Do you remember those cards? 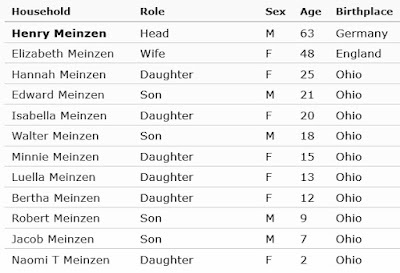 The first family I searched for was my mother's paternal grandparents whose surname was Meinzen and who, I knew, were from Steubenville, in Jefferson County, Ohio. From my mother I learned that the family consisted of Henry and Elizabeth Meinzen, and their children, my mother's aunts, Belle, Mina, Lula, and Naomi, plus her father, Bob or Robert. This was my first experience with Soundex and I learned that the code for their name was M525. The first census I searched was the 1900 census. Going to the public library to do this research, using the microfilm reader, finding their family -- it was all so exciting! When I found the Soundex index card on the microfilm I noticed that there were two cards because there were so many people in the family. I questioned whether it was really my great-grandparents or not because of all the extra people. The card had a list similar to the one below, except, of course, it had been typed on a typewriter on what looked like 4" x 6" cards. There was enough similarity between the names my mother had given me and those on the cards to decide it was my family. But who were all these people whose names my mom hadn't told me? Did my grandfather really have nine brothers and sisters? How did my mom not know this? Finding the answers to those questions was a multi-year research effort. 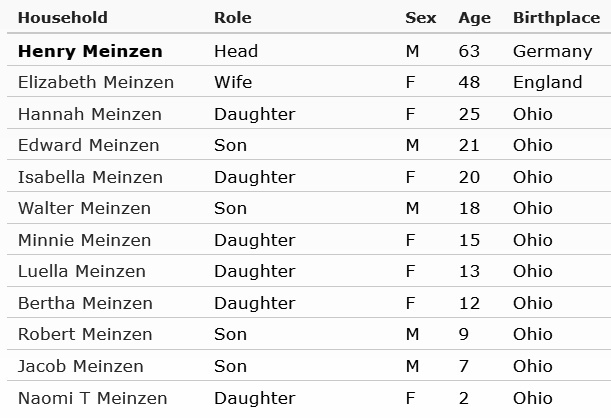 Since finding this family in the census, I've spent a good amount of time researching each individual (plus others who weren't listed with the family in the 1900 census). It's been an adventure filled with births, marriages, accidents, deaths, and some humor, too. Stories and information about my Meinzens thread their way through blog posts over the years. This trio of firsts -- first family to research, first Soundex to find, and first census to view -- were perfect for a new researcher. I would not change a thing about my first research experience. This post was written for the prompt "First" for Amy Johnson Crow's 52 Ancestors in 52 Weeks, 2019. Soundex! I remember. I would go to the National Archives in the next state to view the microfilms of the sounder & the reports. It is much, much easier now to look online but those were exciting days when we discovered a family! That is a great FIRST for 52 ancestors in 52 weeks. Thank you, Colleen. Maybe it was so exciting in those days because there was so much more work involved. It was really a triumph to find an ancestor. I appreciate how easy it is these days, too. I can't remember what was first in my early days of research. I do recall going to a Family History Center with my mother and using whatever equipment they had then. See - I don't even remember THAT. It's interesting how we remember some things and not others, isn't it, Wendy. I think you grew up in a home that did family history (thinking that your mother was a DAR member?) so maybe your first research experience wasn't as impactful (and memorable) as mine. But, of course, you remember lots of other research experiences!